Why Is My Dog's Nose Dry & Cracked? 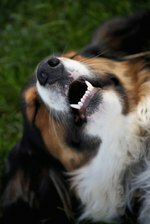 A dry nose is normal for a dog when he first wakes up -- it's perpetually moist because he licks it a lot, and he gives it a rest while sleeping. According to Pets Adviser, a cracked nose can be caused by a medical problem or may just be a matter of a dry environment. Home remedies can usually cure dry nose problems, but if your pup exhibits additional physical or behavioral symptoms, it's time to see your vet. Soothe a dry nose with coconut oil. A change in the weather can lead to changes in nose skin. Your dog could have seasonal allergies, which can lead to sneezing, nose and eye irritation and a drippy, or alternately, dry nose. According to Pet MD, a congested, dry nose can also be a symptom of a canine cold. If your dog isn't getting enough water, he could become dehydrated. In addition to a dry or cracked nose, your pup may have a dull, dry coat. Supply fresh, clean water in ceramic or stainless steel water and food dishes -- plastic can be an irritant to your dog and could result in mouth and nose irritation. If you're putting out water and he's not drinking it, that's cause for concern, and a vet should be consulted. Just like your skin changes in different temperatures and climates, your dog's skin changes as well. A dry, cracked nose could come from snuggling up close to a vent in the house during chilly winter months, getting frost-bitten in the cold or from being exposed to the sun's rays. Treat your pup's nose the way you'd treat your own -- apply a pet-friendly sunscreen and don't expose him to cold temperatures for extended time periods. Use a humidifier in your home to add moisture to the air. This benefits both you and your pup. Apply a bit of petroleum jelly to his nose several times a day, when you notice it looking dry. The jelly will moisturize the nose and soothe soreness. Olive or coconut oil can also be applied. Avoid any moisturizers made for humans, as the perfumes and chemicals can be toxic to your pup. Sometimes, a dry, cracked nose is a sign of an underlying medical condition. If home remedies don't make a difference within a few days, or if your dog exhibits other unusual physical symptoms, call your vet. According to American Animal Hospital, your pup could have an immune system, hormonal or metabolic disorder, or even cancer. Your vet may use blood or urine tests to rule out some of these conditions. A skin biopsy, skin scraping or impression smear might be necessary to narrow the diagnosis. Your vet may refer you to a canine dermatology specialist for further evaluation. Why is My Dog's Nose Running?